In 2012 the UK government made it illegal for migrant domestic workers to change employers. Parliament has the chance to restore that right this week—it must do so. 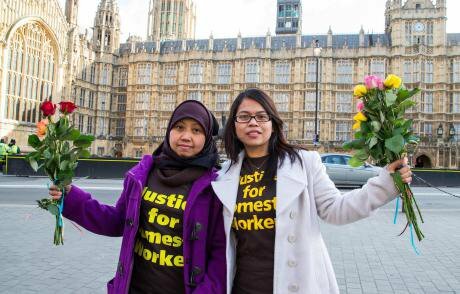 Members of Justice for Domestic Workers outside the UK parliament, London, March 2015. Kalayaan. All Rights Reserved. This week, British MPs face a simple choice. They must decide if it is right that a woman who flees abuse should become an undocumented migrant just because she runs away. Women like Joycelyn, a young Filipino mother who was brought to London from the Gulf, accompanying her Emirati employers. Jocelyn is one of hundreds of victims of forced labour and other forms of exploitation by their employers in the UK. Joycelyn was told she’d be coming to the UK to care for her employer’s family. Once she arrived in London, the depressingly familiar pattern of abuse soon began. She was on call around the clock—caring for four small children, doing all the cooking and cleaning for a demanding family. She worked from dawn until at least midnight, seven days a week. A day off—never mind a holiday—was unthinkable. Like many other young women in her position, she stuck it out for a while. “If I don’t send money home, my children don’t eat,” she said. “I sacrifice myself for them.” But faced with growing sexual harassment from her employer Joycelyn finally fled, and in doing so became one of a growing number of such women living undocumented in the UK. Some 15,000 migrant domestic workers come to Britain every year accompanying well-to-do families, most of them from the Gulf, and often staying in London’s wealthiest neighbourhoods. Some then endure treatment that has no place in modern society: having their passports confiscated, working extremely long hours without breaks and sometimes no pay, physical and psychological abuse, being locked in the home, sleeping on the floor, living off food scraps. Sometimes they are not allowed mobile phones or cash to buy basic goods. In one particularly shocking case, a young woman was forced to make her own sanitary towels from nappies. Domestic workers are one of the most vulnerable groups of employees in the world. They are entirely dependent on their employer for income, and often their home too. The nature of domestic work means it takes place behind closed doors, so abuse can easily be hidden. Domestic workers in the UK, most of them women, used to be able to leave abusive employers and work legally for someone else. But in April 2012 the UK government changed the rules, in an apparent effort to limit immigration. Now migrant domestic workers enter the UK on a ‘tied visa’, binding them to their employer and thereby giving them an inordinate amount of power. If workers leave, even to escape horrific mistreatment, it means breaching immigration rules. So women like Joycelyn face an awful choice: stay and suffer unimaginable hardship, or run and go underground. Going home is rarely an option, given the pressure to provide for their families back home. As the UN expert on contemporary slavery noted in a 2010 report, migrant domestic workers employed by diplomats are particularly vulnerable. Not only do their visas typically prevent them from changing employers if they are exploited, but national laws do not apply to their employers as they enjoy diplomatic immunity. With diplomats immune from prosecution, domestic workers are never able to bring their bosses to justice in cases of abuse. But allowing these workers to change employer would be a crucial step forward. These serious abuses that we are seeing now in the UK are also worryingly similar to those taking place in the Gulf states. Human Rights Watch and other groups have exposed how the visa-sponsorship system there known as ‘kafala’, which prevents domestic workers from changing employer and sometimes from leaving the country without their employer’s consent, often traps them in serious abuse. According to the Home Office, 80% of migrant domestic workers coming to the UK arrive from the United Arab Emirates, Saudi Arabia, Qatar, Kuwait and Oman—all of which operate ‘kafala’ systems for domestic workers. Qatar has been slammed for the abuse of construction workers building World Cup 2022 stadia, while Abu Dhabi is under fire for the mistreatment of migrants building a global cultural hub. The horrific treatment of domestic workers has even driven several governments, like Ethiopia, to ban their women from migrating to Gulf countries. But these bans do not prevent some women from going anyway, who take greater risks by migrating through irregular channels and working under even less protection. The ‘kafala’ system is key to why worker abuses soar unchecked in the Gulf. To many employers and domestic workers visiting from the Gulf, the UK’s ‘tied visa’ and the ‘kafala’ system look remarkably similar. Yet instead of making it clear to employers they must respect their workers’ rights and treat them with dignity while in the UK, by using the tied visa the UK government is sending a message that the sponsorship system continues here. Restoring their right to change employer alone will not put an end to all the exploitation domestic workers face, but it is key to letting workers leave abusive situations without fearing removal from the UK. It helps give workers confidence to report the abuse to the authorities and seek the protection they need. A visa that allows them to work for another employer also keeps them ‘visible’, and annual renewal applications allow the authorities a chance to scrutinise the conditions of employment. In a 2009 report on Human Trafficking in the UK, the House of Commons Home Affairs Committee recognised that the ability to change employer was “the single most important issue” in preventing the forced labour and trafficking of such workers. Prior to 2012 workers turning to Kalayaan, a charity that supports migrant domestic workers in the UK, could receive real, practical help to rebuild their lives. But now, Kalayaan must tell frightened women who seek advice that in the eyes of UK authorities they have broken the law. On learning this, many disappear. Some may find informal work with someone else, but their lack of status puts them at risk of further exploitation. Two successive parliamentary committees have urged the government to restore the right for migrant domestic workers to change employer. Abolishing the tied visa would remove, at a stroke, what the UN says is a major risk factor in this kind of abuse. Last month, the House of Lords adopted this important amendment to the Modern Slavery Bill, giving these women a basic but vital protection. It is now the turn of British MPs to cast their vote, and they must decide this: does the UK want to be compared to the Gulf’s abusive ‘kafala’ system, and all it stands for, or should it restore this vital tool to protect vulnerable women? There surely can only be one answer.